My husband read this a few months back and I really had wanted to read it, but given my work reading marathon, I just couldn't justify it, unless I listened to it on audio. And I'm so glad I did! Especially because it came with some fun extras! 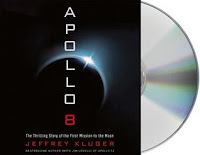 The book doesn't assume you already know anything about space flight, and gives a good overview of the entire Gemini and Apollo programs, a cruise-by of most of all the active astronauts, and comparisons to where the Soviet flight program was at the time. The narrator pronounced it "gem-in-ee" which is how I've heard real astronauts pronounce that word, not "gem-in-eye" like we call the astrological sign. That was a good detail. And at the end, we got two tracks of an interview between the author and Commander Frank Borman, and then about 5 tracks of real audio from the flight itself, both excellent extras. This book is publisher by Macmillan, my employer, and I got the CD audio free from work.